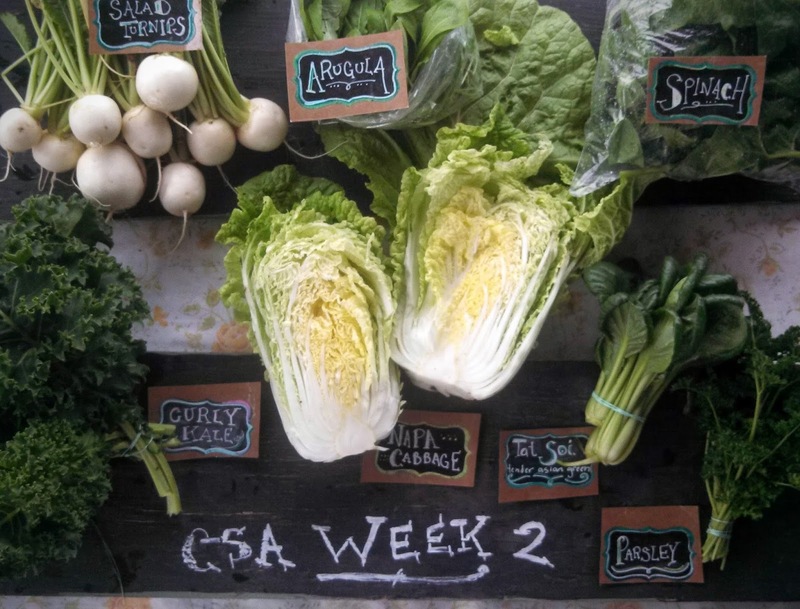 We hopeCSA pickup went smooth for you last week, and that you enjoyed your fresh spring greens. Last year we had 25 members and this year we doubled to 50 members. Fifty members is still a Very Small CSA and I feel confident our production will transition to the larger membership this year. The place where we have a steeper learning curve is just keeping up with paperwork and packing sheets. Thank you for your patience as we are still adding members to our Google contacts and email mailing list. Last week we had the right number of shares at each of the pick ups (phew!) and we are working to make sure that happens again this week...and every week going forward! Early Spring is always a time for lots of fresh greens and braising greens here in the Northwest and we try to change things up from week to week so it's not just a month of kale and bok choi. Before you know it, there will be a much wider variety of summer and then fall veggies filling your share each week. If this is your first time participating in a CSA, don't worry, you didn't sign up for 21 weeks straight of just salad and braising greens (although these salad greens and braising greens are pretty awesome, right? ). Napa Cabbage If you have had Napa Cabbage/Chinese Cabbage you are in for a treat. It is great chopped up and used in a coleslaw or sauteed or stir fried. In a hurry? A fun way to cook Napa is to quarter it length wise and put those quarter sections on the grill. Just brush the cabbage with avacado oil and grill until charred, about 3-5 minutes on each side. Serve drizzled with your favorite sesame dressing or a Thai peanut sauce (YUM!) Full Shares are getting a small bundle of Tat Tsoi. This is a tender Asian green very similar to bok choi and can be sauteed/stir fried. Salad Turnips Please braise and eat these turnip greens. I have simply never seen such beautifully perfect turnip greens in all my life. They are one of my favorite greens. And these turnips are pretty much vegetable candy and are amazing sliced up raw. They are also really good chopped in half and baked in the oven. Kale Our kids LOVE kale chips and if you like them too you may be interested in purchasing a large 16x22 'jelly roll' (small lip around the edge) type baking sheet for making kale chips. I have two of them and it makes making kale chips less annoying because you can make more than a handful at a time. I cook them at 250 with coconut oil and salt until they are crispy and delicious. I also love curly kale for soup; it really holds it's shape beautifully and adds a nice texture to either a brothy or a creamy soup. Coming Week 3: Next week we will have lettuce mix and bok choi, either salad turnips or radishes (we'll wait and see how they are looking a week from now). There is a planting of cilantro that looks like it should be just right for next week and….other spring veggies… :) hope you all have a great week!